Primal Roots Farms is a new, local resource for clean, healthy food, located in Bainbridge Township, south of Coloma, MI. We believe nature has things figured out already, so our processes always try to mimic the way they would be found in nature. Our cattle eat our “salad bar” pastures exclusively, we don’t feed them any grain. They grow at a more relaxed pace and we think it’s better that way. Our chickens eat pasture, bugs & non-GMO grains from a local Amish feed mill. Birds are outside at 3 weeks of age, spend rest of life outside in fresh air, sunshine and pastures that we move them through. We use a day range system where the birds free range in a pasture during the day and sleep in an open air coop at night. Our pigs are rotated through their own pastures, where they can dig in the dirt, eat bugs & plants and non-GMO grains from the Amish. 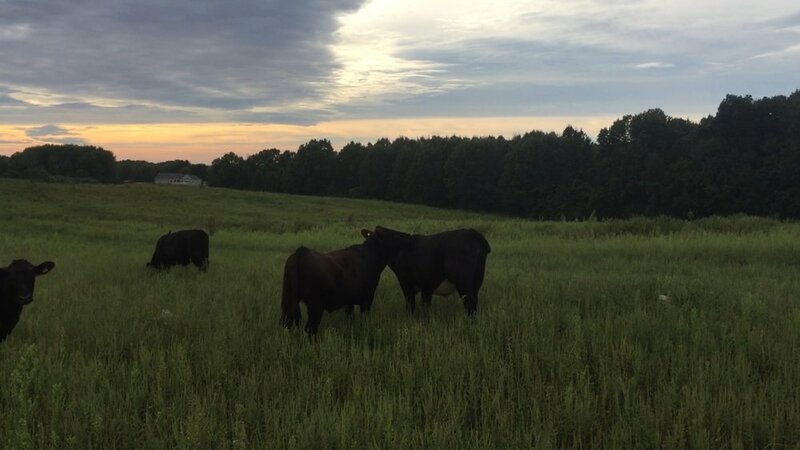 It is our focus on the animals eating our pasture plants that sets us apart. Everything is pastured based. We don’t use any herbicides, pesticides, antibiotics or hormones. “You are what your food eats.” And you can’t have good health if you don’t eat nutritious food. Plus it tastes so much better. Come try it for yourself, you won’t believe the difference! All of our products are processed at USDA or state inspected facilities, depending on the customer.